From a whole array of condiments to choose and concoct your own awesome sauce to appearances of noodle wranglers who indulge you with their noodle-pulling stunts, hotpot restaurants are doing the most to keep their patrons not only stuffed, but also mildly entertained with these little add-ons. 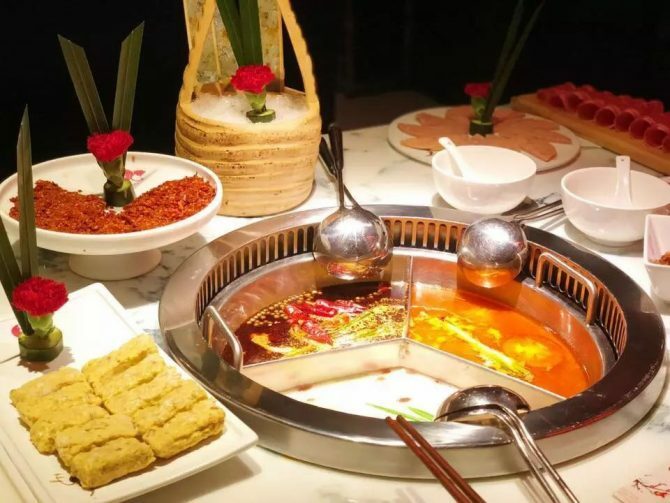 And China hotpot restaurant chain Spice World is not an exception, bringing its own theatrics when it made its debut in Singapore. As we may have already hinted, Spice World’s draw factor points to a solid block of beef oil and ma la stock that is formed after adorable beings, namely: a teddy bear and Sanrio character Hello Kitty ($9). Only exclusive to the ma la option, these spicy creatures are presented inanimately in the hotpot, before almost literally treated to their own version of hell – left over heat until they melt into a soup base. With no artificial flavours, MSG or flavour-enhancer used, these mala soup bases draw heats from Sichuan peppercorns and chillies, sourced from Hongya farmlands and the mountainous origins of Guizhou and Sichuan respectively. They are first prepared in Sichuan China, then air-flown to Singapore. But if can do without the frills, opt for the Benz Triple Flavour Broth ($ 25.90). Like its name suggest, the Benz’s option hosts three different types of broths in a pot, shaped after the automobile brand’s symbol. 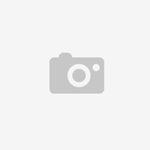 Aside from the signature Mala, which comes in three level of spiciness, other broths available includes pork belly and chicken, three-delicacies (pork, chicken, duck), wild mushroom, tomato, tom-yam, and curry. 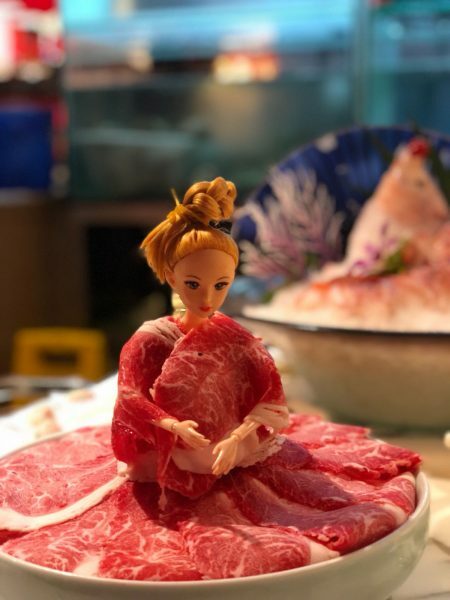 For nosh to go with the broths, opt for Australian M8 Wagyu beef ($38.90) that not only offers high-grade beef in perfect marbling, but also presented in way reminiscent of a meat-dress touting Lady Gaga circa 2010 – the strips are wrapped around a literal Barbie doll. Another note-worthy dish is Prime Minister’s Pork Balls ($12.90), good-humouredly given that name as it was former U.K Prime Minister David Cameron’s favourite, made from fatty and lean pork belly, onions and cilantro, before bound together by an egg. Cooked when they float to the top of the broth, the pork balls are tender and flavourful, elevated by a subtle touch of the controversial cilantro. 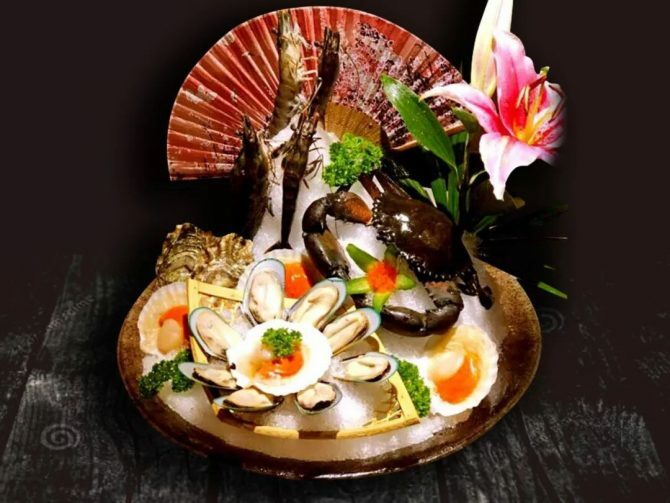 Other treasures to try at Spice World are the Australian Mutton Slices ($28.90) that is devoid of the pungent smell fussy eaters may detest, and the Seafood Platter ($59.90) that comprises oceanic delights of mussels, crabs and even shrimp paste made from 100% shrimp meat and tobiko! 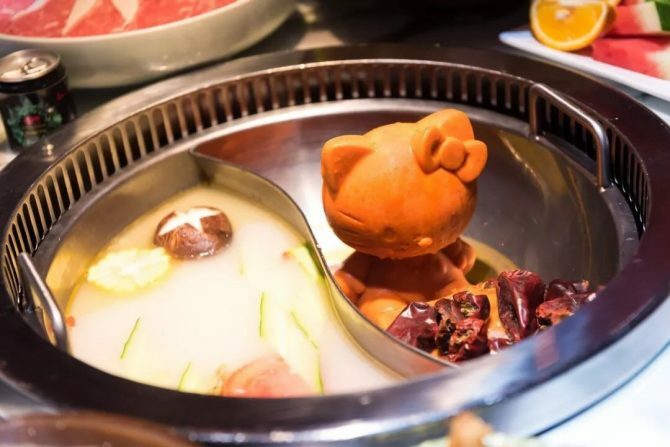 So whether you love mala or have a sadistic desire to watch Hello Kitty subjected to a gruesome, but very delicious, demise, pop on by to SpiceWorld Hotpot almost anytime – no really, the restaurant opens until 6am on weekends.